Citation: Swam the partly frozen creek, under fire, in the attempt to capture a crossing. 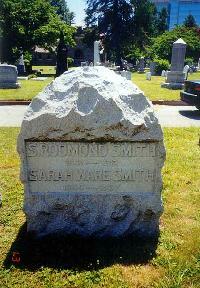 Samuel Rodman Smith was born April 20, 1841, in Wilmington, Delaware, the son of Albert and Elizabeth Wollaston Smith. When the Civil War broke out he enlisted, along with his brother, Linton, in the 4th Delaware Infantry raised by Col. Arthur Grimshaw in June, 1862. He was described as 5' 10 1/2" tall, medium complexioned, brown eyes, brown hair, and weighed 165 lbs. Men of New Castle and Kent County comprised the bulk of the 4th Delaware along with ex-prisoners from Fort Delaware who had taken the oath of allegiance. The unit guarded the du Pont power works for a while before being transfered to Alexandria, Virginia where they patrolled for about a year and a half ending in late 1863. Life for the 4th Delaware became more serious at that point as they helped press in on Richmond and Petersburg, Virginia. 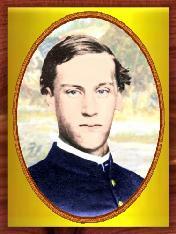 Smith was promoted to Captain in June, 1863. On February 4, 1865, the 4th Delaware, as part of General Warren's V Corps was ordered to move between Halifax and Jerusalem Plank Roads, cross Rowanty Creek and support General Gregg's Cavalry at Dinwiddle Courthouse. As they approached the Rowanty Creek they were halted, as the Rebels had burned the bridge and a band of about 100 of them were firing on the soldiers from the south side of the 60 foot wide creek. Smith's deed of valor came as they tried to cross this creek. Several regiments charged and tried to carry the ford without success. Finally, it was the 4th Delaware's turn. Captain Smith watched as Captain David E. Buckingham, also from Delaware and awarded the Medal of Honor, ventured out into the creek, making a successful crossing. "The water proved to be over six feet deep.....but I was a strong swimmer, and although encumbered by a haversack, belt and cape overcoat, succeeded in reaching a small island in mid-stream, under a heavy plunging fire which splashed the water around me." With the example of these two men others soon followed and they eventually captured 50 Rebels and secured the creek. Smith had one last moment of glory at the surrender of Lee to Grant at Appomattox. Because Col. Moses Gist was ill, command of the Delaware Battalion (3rd, 4th, 8th regiments) devolved upon Smith. Both he and his brother witnessed Lee and Grant emerge from the McLean House that day. Smith was discharged at the war's end and returned to Wilmington, Delaware where he resumed the study of law in 1866, and was admitted to the bar a year later. Once retired, he lived in several places that stretched from Georgia, Mississippi, Arkansas, California, North Carolina, and by 1912, he was the Mayor of Miami, Florida. 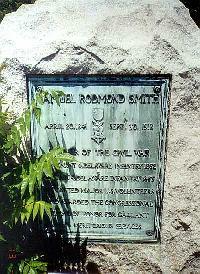 It was here that he died on September 30, 1912, at the age of 71 of tuberculosis. He was interred in the Wilmington Brandywine Cemetery. "Click Here" for Samuel Smith's Find A Grave record.